Southam First is a formally constituted group of local volunteers who are working to make Southam a place people want to live, work, shop and visit. Southam First was originally formed in 2011 as part of an initiative by Stratford District Council to deliver improvement objectives identified in a review of Southam town centre in 2008. The delivery of specific town improvement measures was to be funded by the Section 106 payment received from Tesco in 2010, following approval of their planning application for an edge of town store. The proposals included the establishment of a sustainable Town Centre Partnership, business start-up grants, support for the Farmer’s Market, shop front improvement grants, and regeneration works to the town centre. Stratford District Council appointed Consultants Action for Market Towns (AMT) to assist with the delivery of some of these objectives, and in particular, the formation of Southam First. Southam First came into being as a fledgling Town Centre Partnership, following a series of ‘Call to Action’ meetings organised by AMT. The group’s Terms of Reference, objectives, structure, and policies were developed over succeeding months, and a large and diverse group of volunteers from the town became members of Southam First. The group’s name and branding were designed with the theme of prioritising Southam, and its logo image was taken from the iconic shape of the Southam Stories sculpture, located outside the Library in Southam’s High Street. Southam First was originally structured with four separate groups, to help deliver different aspects of the proposed town centre improvements. These groups were: Community & Culture, Town Improvement, Business & Economy, and Marketing & Events. The Business & Economy group was made up of business people in the town centre and they organised business development training, window dressing workshops and also worked with the Farmers Market, running themed promotional markets. A power supply unit was also installed on Market Hill to support street markets. Flagpole brackets were installed for participating businesses to take both flags and Christmas trees. The Town Improvement group was involved in Street Scene ‘deep clean’ days and they arranged for the replacement of a modern light with a Victorian lamp stand in Chickabiddy Lane. They also applied for new Free Car Park directional signage to be installed, and this group received training in the annual Benchmarking surveying techniques. Another town improvement project involved the renewal of the gateway to St James Churchyard. However, this project stalled because of difficulties relating to obtaining the appropriate consents. 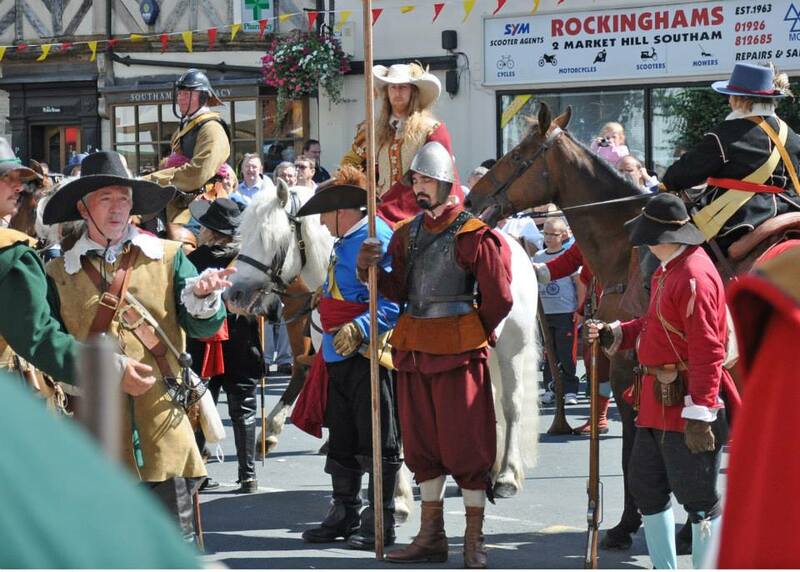 The Community & Culture group worked with Southam Heritage group in planning a major ‘Living History’ event which came to fruition in summer 2013 with the Battle of Southam weekend in partnership with the Sealed Knot and many other local organisations. This group also presented a Southam Games event in 2012 to coincide with the Olympic Games. The Marketing & Events group established a website for Southam First, and was involved in various promotional initiatives in the town. However its primary focus was staging a series of major town centre community events and street markets, and various assets were purchased to assist with these events, for example branded gazebos and a PA system. 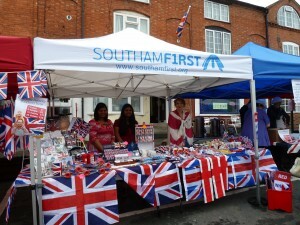 The Section 106 funding for Southam First’s events was exhausted by Summer 2013. 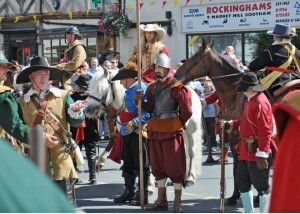 The major events during 2013 were therefore funded following a successful application for an ‘Operation Footfall’ grant from Warwickshire County Council. Stratford District Council’s direct involvement with Southam First ceased after the Section 106 funding ran out in 2013, although the District Council still provides advice and strategic support. In early 2014 several key members of the Southam First Board, and all of the Events team, stepped down. The remaining members of the Southam First Board organised a re-launch process to review the objectives of Southam First. As a result, several new people joined the team, and the group undertook to simplify its Constitution and structure. Two members of the Committee agreed, on behalf of Southam First, to lease a storage unit for the group’s assets at The Grange, Southam. In the absence of an events team, the new Management Committee agreed to concentrate on facilitating and supporting events run by existing community groups during 2014. In 2015 a potential 1940s themed event was postponed because of major road works in the town centre. Southam First did, however, continue to organise and carry out the Town’s annual Benchmarking surveys in April / May each year. 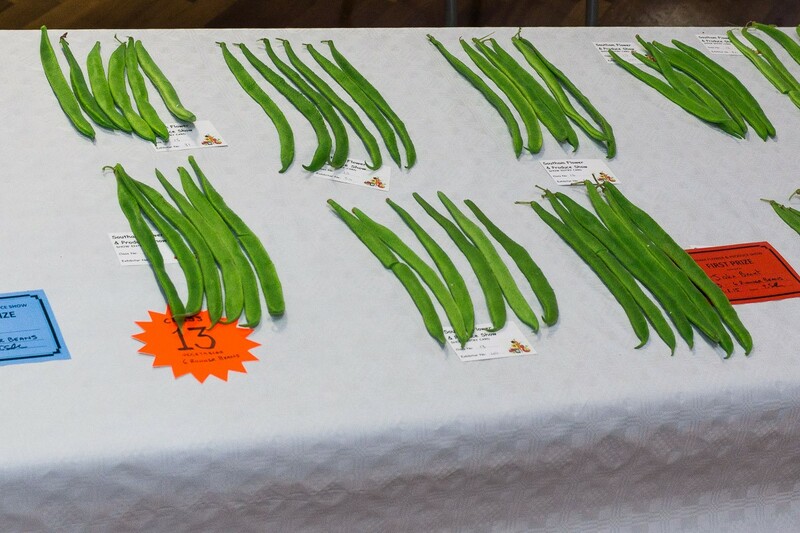 In 2014, Southam First successfully revived the annual Southam Flower & Produce Show, by forming a committee of volunteers from members of interested community groups. The first Show was held in August 2014 and was a great success, and the Show was staged again in August 2015 and will take place again in September 2016. 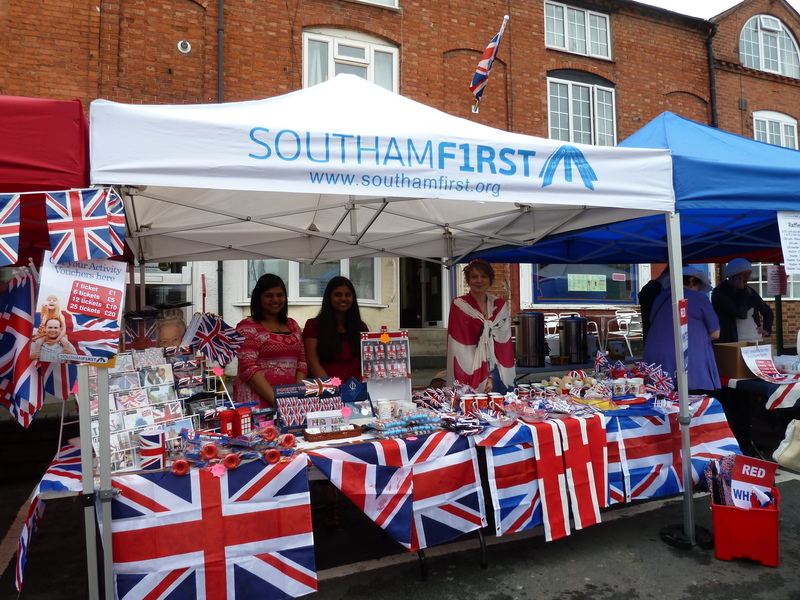 Southam First was successful in achieving funding from Southam Town Council and sponsorship from local businesses for this revived annual community event. Southam First continues to assist Southam & District Lions with loan of equipment for their annual May Day Fete, and the October Mop Day Pig Roast. Equipment is also loaned to the organisers of the Southam Carnival and the annual ‘Party on the Pitch’ event at Southam Rugby Club. Southam First loans equipment including its bespoke Santa’s Grotto to Southam Christmas Lights Association for their Switch On events. Southam First also assists the Christmas Lights team with storage of the town’s lights prior to their installation. In early 2015 Southam First agreed to provide fund-management and administrative support to the group of local volunteers developing a new website for Southam and Area (southam.co.uk). These volunteers are known as the STAP group (Southam Town and Area Promotions), and got together as a result of an initiative led by Stratford District Council’s Business, Enterprise and Tourism Officer. The STAP group became a sub-group of Southam First, and funding was applied for from Warwickshire County Council. Southam First organised the purchase of the domain name and web-hosting service, and members of Southam First have worked closely with the STAP team on the design and content of the website. In addition, the STAP group is promoting the website and encouraging local businesses and community groups to list their services and activities. Another project this sub-group is involved in is the production and distribution of a promotional Visitor Information leaflet, to raise awareness of Southam and its surrounding villages in the wider tourism catchment area. In April 2016 and again in April 2017, Southam First organised French Street Markets (in partnership with ‘France At Home’). The events are so popular, they have become an established calendar event on a Sunday in Springtime. With its diverse range of skills, network of established contacts, collection of useful assets and highly experienced team, the Committee of Southam First continues to offer support for community initiatives that it considers promote the town and benefit the local economy.